Total ORACFN: 75456 | Flavonoids:1,520mgWhat does this mean?Xocai Nuggets, are an extremely high cocoa content chocolate combining the exotic flavors of dark chocolate with Acai Berries and Blueberries. Each 12-gram Xoca Nugget is made with rich, dark, Belgian Chocolate. There are 100 Nuggets per case. They are suitable for Vegetarians and are considered a “Clean Product”: No Artificial Colors, No Artificial Flavors, No Preservatives, and No Sucralose. Each 12-gram piece of Xocai Nugget has an ORAC Value or Antioxidant Content of 3,120. Furthermore, the Xocai Nuggets are the only Chocolate Bar, dark or milk, in the marketplace that has printed on the packaging the ORAC Value or Antioxidant Content of the product. We’re truly excited that we have the Ultimate Antioxidant Treat with a balanced nutritional profile. Like all Xoçai® Chocolate, the Nuggets proudly display the ORAC Value or Antioxidant Content on the packaging. We’re truly excited that we have the Ultimate Antioxidant Treat with a balanced nutritional profile. The dynamic blend of cacao, açaí berries, and blueberries makes this the most potent antioxidant product available! Patented unprocessed cacao optimized with açaí berries and blueberries create a formula unlike any other. Naturally sweetened with raw cane juice crystals, a low-glycemic sweetener. Total ORACFN: 49464 | Flavonoids:1,740mgWhat does this mean? The Xoçai® X Power Squares use cacao that produces a high-antioxidant dark chocolate that boasts eight times the levels of epicatechins and catechins, and four times the levels of procyandins than cacao produced with standard processing. X Power Squares are loaded with antioxidants and flavonoids. 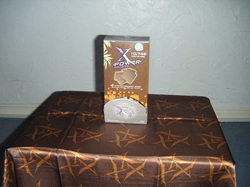 The Xoçai® X Power Squares are the most powerful, health-promoting, decadent chocolate ever produced. Don’t play the guessing game! With the Brunswick Labs Certification Program, you know what you are getting – third-party certification on a finished product. otal ORACFN: 75405 | Flavonoids:1,203mgWhat does this mean? The North American diet is almost completely void of the essential fatty acid Omega-3. Researchers believe that at least 60% of North Americans are presently deficient in Omega-3 fatty acids and that children are obtaining almost no Omega-3. In fact, the deficiency of Omega-3 in the North American diet has now been linked to an extensive list of health-related problems cited in over 2,000 scientific studies. Omega-3: Essential to health.They are considered essential fatty acids, which means that they are essential to human health but cannot be manufactured by the body. The National Institutes of Health and International Society for the Study of Fatty Acids and Lipids (ISSFAL) recommends that individuals consume at least 220mg daily of DHA (docosahexaenoic acid), the most important Omega-3 fatty acids, and that pregnant and nursing women consume at least 300mg daily. For comparison purposes, there is 100mg of DHA per 1/4 cup of canned tuna. The Xoçai™ Omega Squares™ have a minimum of 200mg of DHA and EPA per three 11 gram squares. The Xoçai™ Omega Squares™ are an excellent source of Omega-3 and promotes the necessary balance of essential fatty acids through the Açaí Berry, flaxseed and a patented, plant-based, encapsulated Omega-3. Reverse the Imbalance!It is important to maintain an appropriate balance of Omega-3 and Omega-6 in your diet as these two substances work together to promote better health. A healthy diet should consist of roughly two times more Omega-6 fatty acids than Omega-3 fatty acids (2:1). Many researchers suggested that the present excessive levels of Omega-6 fatty acids, relative to Omega-3 fatty acids (10:1), in the North American diet has created a significant imbalance and is a major factor in the rising rate of diseases in the United States. Omega-9 fatty acids are not classified as essential fatty acids, because they can be created by the human body from unsaturated fat. The Xoçai™ Omega Squares™ has been developed to provide your body the essential fatty acids for preventative and better health during every stage of your life! Total ORACFN: 56500 | Flavonoids:1,128mgWhat does this mean? The High-Antioxidant Meal Replacement Shake, which boasts an amazing Total ORACfn score of over 50,000 per serving, can significantly boost your antioxidant (ORAC) intake-and lose weight at the same time! Eating a 50,000 plus Total ORACFN diet every day is easy. You can do it by following the suggestions for high-antioxidant foods, and especially by incorporating the X Protein Meal Shake into your daily diet. It's super high in antioxidants, and is proven to help lose pounds, boost energy and make you feel great. With Xoçai, you will be eating at least 50,000 ORAC or more every day for the next 30 days (and you will want to continue longer). Remember, the ORAC measures how well components of food mop up the free radicals in the bloodstream. Eating 50,000 or more will significantly boost the antioxidant potency of your blood. This is one of those rare areas of nutrition where more truly is better. Almost everybody loves Chocolate, especially when these products have amazing Health Benefits - Xocai Nuggets, Xocai Power Squares, Xocai Omega Squares and Xocai High Antioxidant Shake. They are the Ultimate Antioxidant Treat! 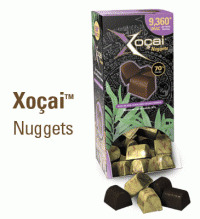 Xoçai™ Nuggets are delicious and have an extremely high antioxidant content. They are an extremely high cocoa content chocolate combining the exotic flavors of rich, dark Belgian chocolate with Açai berry and Blueberries. They are suitable for Vegetarians and are considered a “Clean Product”: No Artificial Colors, No Artificial Flavors, No Preservatives, and No Sucralose. Each 12-gram piece of Xoçai™ Nuggets has an ORAC Value or Antioxidant Content of 3,120, the Ultimate Antioxidant Treat with a balanced nutritional profile. Xoçai™ X Power Squares use chocolate that is made by a unique cold-pressed process to an exclusive formulation which retains a much higher antioxidant value than chocolate produced with standard processing. X Power Squares are loaded with antioxidants and have an unparalleled ORAC Value of 3,582 per 6g Square - the most powerful, health-promoting, decadent chocolate ever produced. 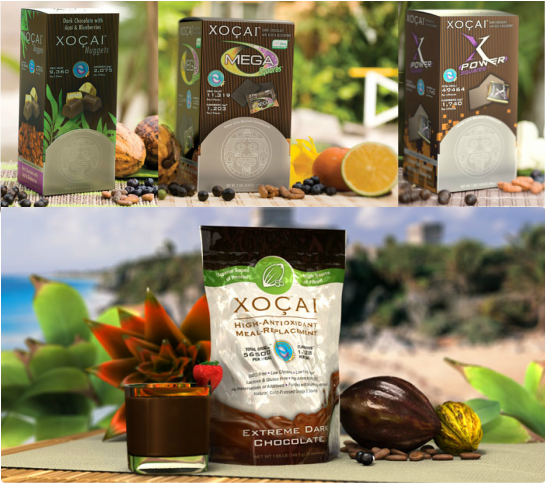 Xoçai™ healthy chocolate products feature premium cold- pressed chocolate and the super-food açai berry the perfect ingredient combination for the perfect product. Chocolate: is one of the richest food sources of anti-oxidants in the world, with many scientific studies to demonstrate its varied health benefits. Açai Berry: recently emerging from the Amazon rain forests of Brazil, the nutrient packed berry has been heralded by various doctors, health professionals and celebrities for its unusual high levels of antioxidant compounds. Unlike commercially produced chocolate, Xoçai™ chocolate is based around the highest grade, healthy chocolate that retains optimal levels of natural anti-oxidants, cocoa butter and other ingredients. Xoçai™ chocolate is just delicious to eat! So why would you consider the Xoçai™ range of chocolate? well: it has the highest ORAC Score, it's made with a proprietary processing method to preserve anti-oxidants, uses natural sweeteners, uses natural cocoa butter, no artificial ingredients, fillers or waxes, and as we said, it just tastes good. Extreme Popularity: 9 out of 10 people report that they "crave" chocolate. The average UK person eats 18lbs of chocolate every year! Little Training: Because of people's familiarity with and love of chocolate, it requires little product training. Media Friendly: simply stated, chocolate is all over the news. Scientific Support: Dozens of scientific studies link chocolate to a wide range of health benefits. Emerging Health / Wellness Category: Experts point to various factors indicating that premium-grade healthy chocolate is poised for massive growth within the health and wellness industry over the next decade. In short, the healthy chocolate category is positioned on a trajectory of tremendous success, helping to make it your once-in-a-lifetime business opportunity. If you would just like to buy the chocolates, then visit www.chocolatesforhealth.co.uk and begin giving your body the anti-oxidants it needs easily.